Mainstream Earth Scientists tend to view Hotspots as “anomalously hot”. They may be on, near to, or far from tectonic plate boundaries. Well known examples include Hawaii and Yellowstone. The origins of the concept of hotspots lie in the work of J. Tuzo Wilson, who postulated in 1963 that the Hawaiian Islands result from the slow movement of a tectonic plate across a hot region beneath the surface. It was later postulated that hotspots are fed by narrow streams of hot mantle rising from the Earth’s core-mantle boundary in a structure called a mantle plume. Whether or not such mantle plumes exist is currently the subject of a major controversy in Earth science. Estimates for the number of hotspots postulated to be fed by mantle plumes has ranged from about 20 to several thousands, over the years, with most geologists considering a few tens to exist. Hawaii, Réunion, Yellowstone, Galápagos, and Iceland are some of the currently most active volcanic regions to which the hypothesis is applied. Most hotspot volcanoes are basaltic (e.g., Hawaii, Tahiti). The mainstream admits “there are two hypotheses that attempt to explain” Hotspots. Currently, there are two hypotheses that attempt to explain their origins. But there are other hypotheses which the mainstream prefers to ignore. One such hypothesis by Jonathan T. Hagstrum was published in 2005. One aspect of the hotspot distribution that has received little attention is its antipodal character. Of 45 ‘primary’ hotspots found in most hotspot compilations 22 (49%) form antipodal pairs within observed hotspot drift limits (≤ 20 mm/yr). In addition, the available ages, or possible age ranges, for both hotspots of an antipodal pair tend to be similar (≤ 10 Myr difference) or overlap. Monte Carlo simulations indicate that the antipodal primary hotspots’ locations and ages are not due to chance at the > 99% confidence level (p < 0.01). All hotspot pairs include at least one oceanic hotspot, and these are consistently opposite those hotspots related to large igneous provinces (LIPs) and continental volcanism. A mechanism of formation is considered in which minor hotspot volcanism is induced at, and flood basalt volcanism is triggered by seismic energy focused antipodal to, oceanic large-body impact sites. Because continental impacts are expected to have lower seismic efficiencies, continents possibly acted as shields to the formation of antipodal hotspot pairs. Antipodal hotspots and bipolar catastrophes: Were oceanic large-body impacts the cause? The protected nearside of the Moon provides clear evidence supporting Hagstrum’s hypothesis that basalt volcanism is triggered by seismic energy focused antipodal to oceanic large-body impact sites. 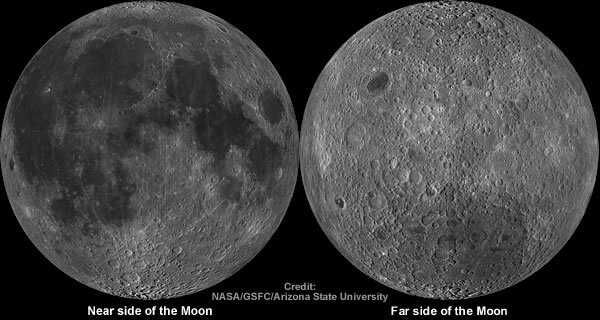 The dark and relatively featureless lunar plains that can clearly be seen with the naked eye are called maria (Latin for “seas”; singular mare), because they were believed by ancient astronomers to be filled with water. They are now known to be vast solidified pools of ancient basaltic lava. Although similar to terrestrial basalts, the mare basalts have much higher abundances of iron and are completely lacking in minerals altered by water. Maria are found almost exclusively on the near side of the Moon, covering 31% of the surface on the near side, compared with a few scattered patches on the far side covering only 2%. Mars also provides clear evidence supporting Hagstrum’s hypothesis that basalt volcanism is triggered by seismic energy focused antipodal to oceanic large-body impact sites. 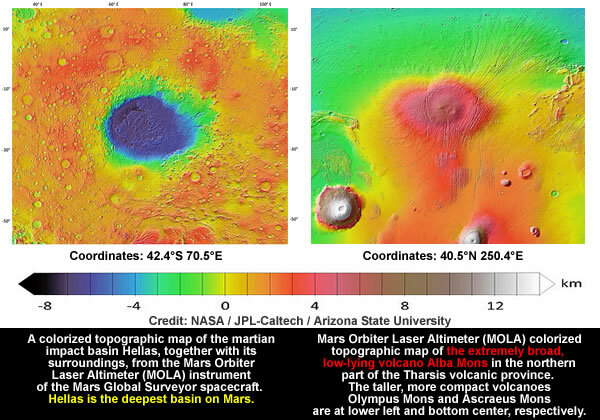 Hellas Planitia is a plain located within the huge, roughly circular impact basin Hellas located in the southern hemisphere of the planet Mars. Hellas is the second or third largest impact crater and the largest visible impact crater known in the Solar System. The basin floor is about 7,152 m (23,465 ft) deep, 3,000 m (9,800 ft) deeper than the Moon’s South Pole-Aitken basin, and extends about 2,300 km (1,400 mi) east to west. Alba Mons (formerly known as Alba Patera, a term that has since been restricted to the volcano’s summit caldera) is an immense, low-lying volcano located in the northern Tharsis region of the planet Mars. It is the largest volcano on Mars in terms of area, with volcanic flow fields that extend for at least 1,350 km (840 mi) from its summit. Although the volcano has a span comparable to that of the United States, it reaches an elevation of only 6.8 km (22,000 ft) at its highest point. This is about one-third the height of Olympus Mons, the tallest volcano on the planet. The mainstream ignores Hagstrum’s catastrophic hypothesis because they would have to acknowledge many additional antipodal impact sites and abandon their beloved seismic model which does not focus seismic energy at the antipodal point. However, a silica planet with a Liesegang Cavity does focus seismic energy towards the antipodal point. Explaining away antipodal seismic waves is a challenge for the mainstream because they rely upon attenuated, indirect seismic waves that have [according to their model] been refracted and reflected [up to three times]. Ridge on 2010 February 11 using USArray data. The epicentre of this event is antipodal to the USArray, providing us with an opportunity to observe in details the antipodal focusing of seismicwaves in space and time. We compare the observed signals with synthetic seismograms computed for a spherically symmetric earth model (PREM). Unsurprisingly, the mainstream model [aka synthetics] is demonstrably bad at predicting antipodal seismic waves. A beamforming analysis is performed over the different seismic phases detected at antipodal distances. Direct spatial snapshots of the signals and the beamforming results show that the focusing is well predicted for the first P-wave phases such as PKP or PP. However, converted phases (SKSP, PPS) show a deviation of the energy focusing to the south, likely caused by the Earth’s heterogeneity. Focusing of multiple S-wave phases strongly deteriorates and is barely observable. Clearly, the mainstream needs a new model to predict and focus antipodal seismic waves. Gallery | This entry was posted in As Above So Below, Astrophysics, Catastrophism, Earth, Geology, Liesegang Cavities, Moon, Science, Solar System. Bookmark the permalink.